The dynamic energy of each planet plays an important role in how we engage with our daily lives. SolaLUNA Bath Teas cosmically capture the botanical essence of our solar system, delivering it directly to your tub. Boost your cosmic alignment with SolaLUNA Bath Teas, custom- blended from 100% organic or wildharvested ingredients. Includes all 10 cosmic planetary blends for full spectrum enjoyment of balancing and nourishing the mind, body and soul. 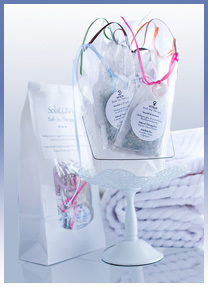 For healing and nourishing benefits of SolaLUNA bath tea ingredients click here. ©2006 Celestial Living Arts. All rights reserved.